We just returned from the EuroTier show held in Hanover, Germany. Billed as the largest animal production trade fair in the world this year's theme was "Digital Animal Farming." Many of the equipment manufacturers highlighted sensor technology designed to measure everything from humidity, lighting, behavior, estrous, etc. and link the data to Artificial Intelligence systems. In the middle of this overwhelming display of "smart farming" it pays to take a moment to consider the real value of all this technology. “Smart Farming” does not mean that you have every piece of high tech equipment on your farm that is available. “Smart Farming” is maximizing your profitability by utilizing the correct combination of technology and quality products. Every production system is different, whether it's a single farm or a large integrated model spread over many locations. First, each production system needs to evaluate new products with a critical eye to determine if it fits their system. Let's take the example of group sow housing. 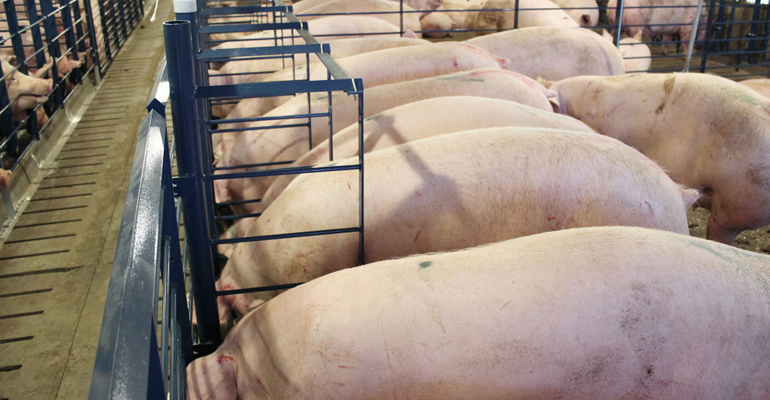 For a farm with a stable workforce and low turnover, electronic sow feeding could be an excellent choice for loose housing. Forcing the same ESF equipment on a production system with higher employee turnover would not yield as good of results. It would be easier to train employees and maintain the equipment with a less intensive system using stanchions and drop feeding — less technology but better results. The second criterion for evaluating new technology is will the production system utilize this new information. Consider feeding sows for maximum performance in lactation. Installing a trigger activated SowMAX dispenser will increase productivity and reduce labor and wastage compared to hand feeding. Installing an electronically activated hopper will yield similar results and record the metered amount of feed to a central record keeping system. The evaluation must then be, is this additional information worth the higher cost and increased maintenance? How will this new information be used to make better management decisions? The third and the absolutely most important evaluation for any new technology is it should LOWER COSTS AND IMPROVE PROFITS. The cost of computerized ventilation controllers is easily recoupled through increased growth rates due to the improved environment, but adding additional features only increases cost with little chance for payback. Take the example of a recent project where the owner wanted to connect the ventilation control to his smartphone at a cost of $10,000. This additional expense would not have significantly improved pig performance and would have only put him in a weaker financial position. Now don't get this wrong, we're not backward thinking Luddites opposed to all new technology, but we think for "smart farming” to be truly smart it has to pass the following criteria. 1) Does it fit the current production system and personnel? 2) Will the information indeed be used to make better management decisions? 3) And most importantly does it increase productivity AND PROFIT? Some new “smart farming” technology only increases data overload and offers very little new information to make smarter decisions. Is it really necessary to individually monitor every animal on a 5,000-sow farm? Careful and thoughtful evaluation will ensure all new products and technology contribute to a farm’s overall profits. Fritz Richards is the sales manager for Hog Slat Inc.’s swine business division. Fritz can be reached frichards@hogslat.com.